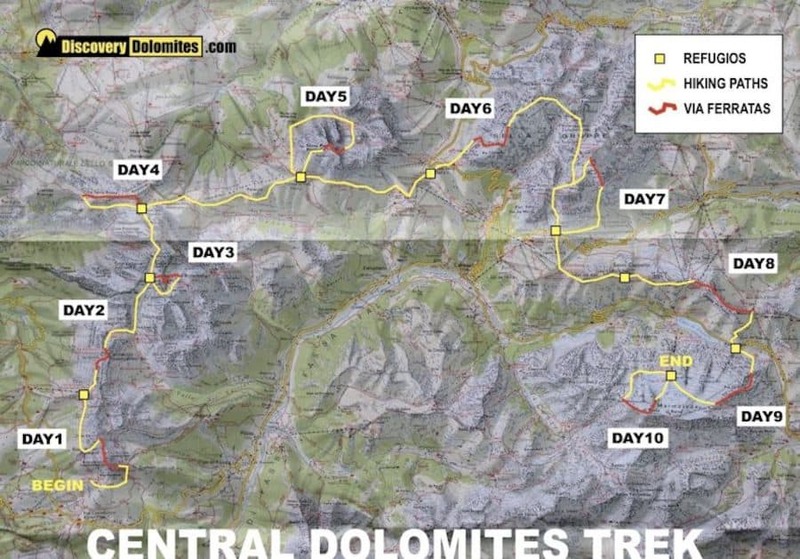 This proposal is in absolute the most flexible and complete via ferrata Dolomites trekking! Flexible because you can choose from 2 to 10 days of via ferrata trekking. 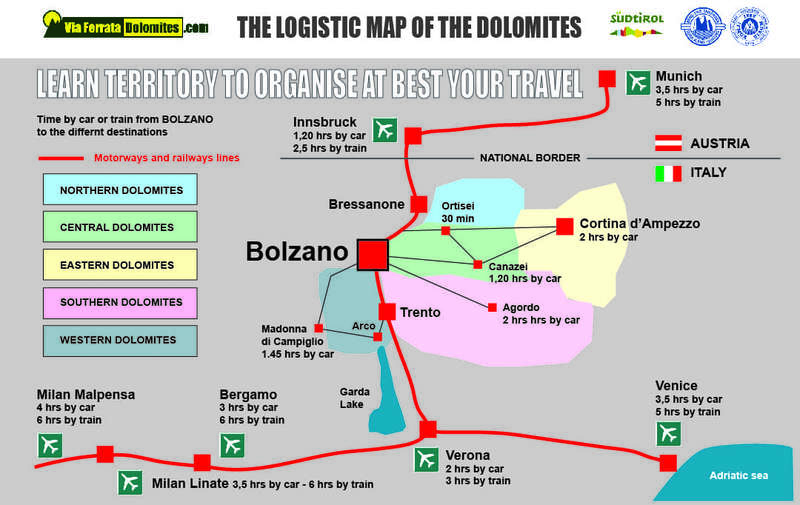 Complete because you cross with via ferratas all the central territory of the Dolomites. The via ferrata Dolomites trekking is a optimal idea for hikers on first time in the Dolomites. A progressive concatenation of via ferratas, day per day, conduce trough the heart of the Dolomites with unique panoramas. A second important aspect and great opportunity of this via ferrata tour is the daily flexibility. Every day we can decide if climb the via ferrata at the program or bypass with a trekking day. This is very good specially for the bad weather days. In any case we can continue with the hut to hut tour. You are free to choose from 2 to 10 days, from hut to hut…. remember: we build your “personal program”! The first day we begin with a easy and short via ferrata in the central Dolomites: Via Ferrata of the Roda de Vael. This via ferrata on the Catinaccio/Rosengarten mountains is a traverse tour that climb the Roda de Vael peak from the north to the south side. The technical difficult are moderate as the exposition in the wall, guarantee is the 360° panorama around the central, western, and part of the southern and eastern Dolomites. Arrive on the evening at Rifugio Fronza alle Coronelle. The second day we continue with the Via Ferrata Santner, the logic continuation along the Catinaccio/Rosengarten mountains. This is a historical via ferrata,a tipical example of the old concept of via ferrata in the Dolomites. Part with iron wire and part in scrambling (with my climbing rope). Arrive on the evening at Rifugio Principe. In this day we climb the peak of the Antermoja (the second main peak of this group of mountains, 3007 m.). This ascension: Via Ferrata d’Antermoja, is on the west face and the downhill is on the east face. In fact we cross the peak from a side to the other and we arrive at the Rifugio Antermoja. This is the basic program, but in this day we have many combinations, longer or shorter, depending of your fit condition. On the third day of via ferrata we can have a concrete idea to set at better your program. Arrive on the evening at Rifugio Antermoja. Total time of this day: 5.00 hrs – Total vertical gain (up): 350 m.
If you like try a difficult via ferrata, this is the best day! We climb the Via Ferrata Laurenzi at the Molignon crest. A long traverse along this complicate mountain that is the terminal of the Catinaccio/Rosengarten mountains. Different difficult passages in a exposed crest. Arrive on the evening at Rifugio Tiersalplhuette. The Via Ferrata Maximiliansteig at the Denti di Terra Rossa is a long traverse on crest, not particulary difficult but sure exposed and panoramic! It’s a good test for where like try this comune situation on the rock. Arrive on the evening at Rifugio Sassopiatto, or Rifugio Vicenza. We climb the Via Ferrata Schuster at the Sassopiatto mountain in the Sassolungo Dolomites group. This is a other historical via ferrata with the iron wire new and a corrected line. The original line of climbing was one of the first climbing in the Dolomites! Arrive on the evening at Rifugio Valentini at the Sella Pass. This day is dedicated at the “first via ferrata of the Dolomites”. The Via Ferrata Poesnecker (Meisules) is the oldest via ferrata of the Dolomites (and of the world). A authentic museum on the wall. Not easy and not short, with this climbing we traverse the Dolomites of Sella Group. Arrive on the evening at Rifugio Forcella del Pordoi. Total time of this day: 6.50 hrs – Total vertical gain (up): 1100 m.
We climb the Via Ferrata Piazzetta at the Piz Boè, a modern and difficult via ferrata with a sportive imprinting that climb directly the main peak of the Sella group: the Piz Boè. Arrive on the evening at Refugio Viel del Pan. In this sector of the Dolomites we enter in the first world war operations area, from here the via ferratas that we climb are original military constructions of the war. The Via Ferrata delle Trincee (trincee = trences) was part of the Austrian troops first line on the front. Now is a very nice climbing that traverse all crests and bunkers along the Padon ridge. Arrive on the evening at Rifugio Pian dei Fiacconi. The last day we climb the highest peak of the Dolomites, the Punta Penia in Marmolada. This is one of the best vie ferrate of the Dolomites! Along the Via Ferrata Punta Penia we cross many WW1 constructions and at peak we end this long combinations of days with a unique panorama around the “magic Dolomites”. Arrive on the evening at Bolzano.